Building childhood memories is something every Mother and Father want to do. Over the years we have hosted many parties for our boys, and a lot of the time coming up with the party idea is just as fun as the party itself. 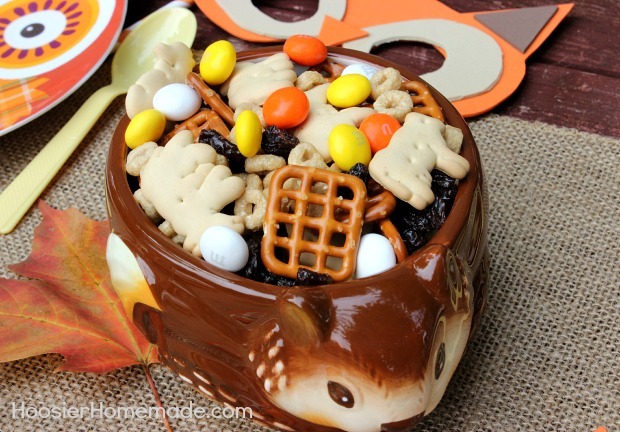 Fall is a perfect time to make these memories with your children, with the leaves changing and Halloween coming up, it’s a great time to host a party. 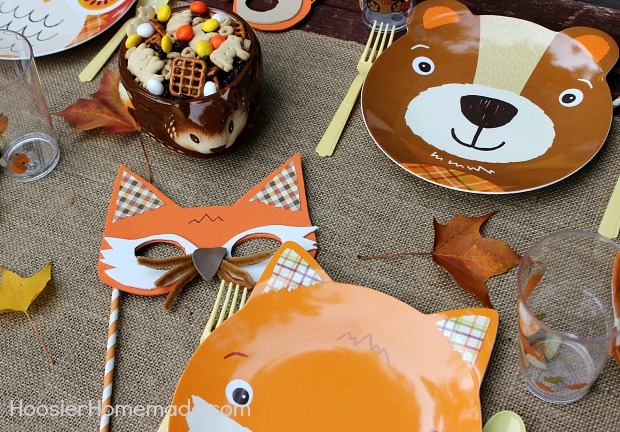 This Fall Party for Kids is jam packed with cuteness, from the plates and cups to the Woodland Creature Masks to the Wild Animal Snack Mix – every single bit of it adds a little excitement to the party. We have lots to share, so I have broken it up into two separate posts. 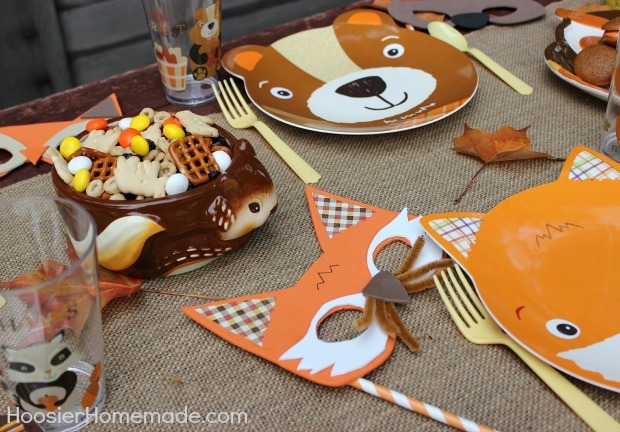 Today I will show you how to create your own Woodland Creature Masks, toss together the Wild Animal Snack Mix in minutes and then set the table for the Fall Party. 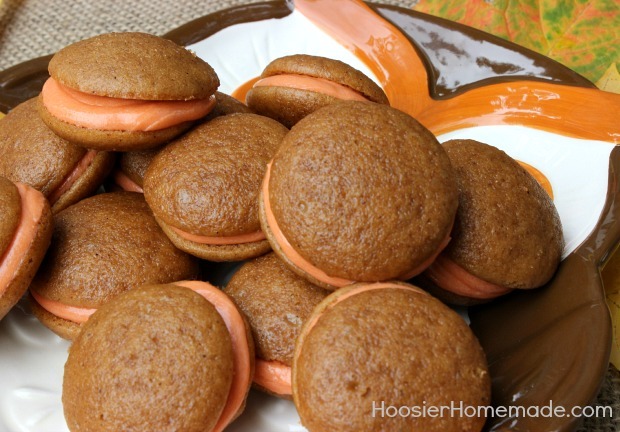 Tomorrow I will share the recipe for the Mini Pumpkin Whoopie Pies, they are super easy too! 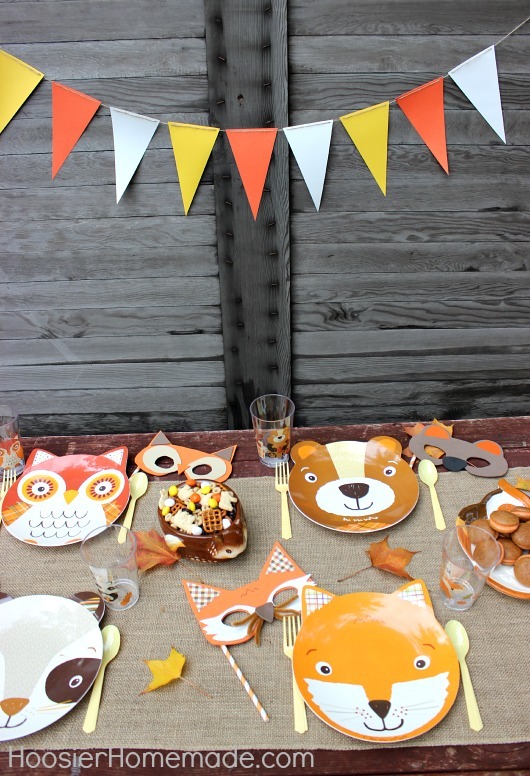 The inspiration for this Fall Party started with the plates. I spotted them at Walmart and just couldn’t help but grab all four – the Fox, Raccoon, Bear and Owl. I’m using the plates and matching cups, they also have bowls that would be darling for breakfast and matching silverware too. Down the center of the table, we used a roll of burlap found near the Fall decorations and Deco Mesh. It works perfectly for a table runner. I gathered some leaves that had fallen from the tree in our front yard and scattered them on the table. 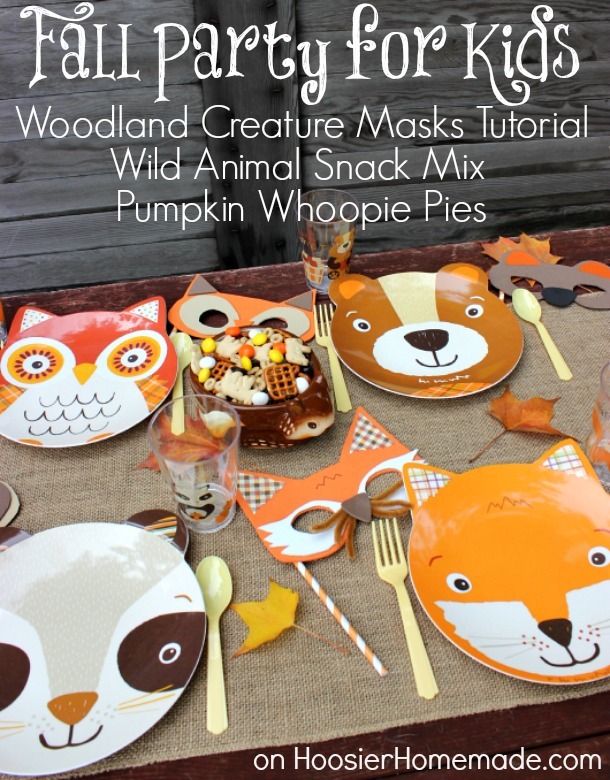 You can’t have a party without a fun craft, decoration or activity, so using the plates for inspiration, I created the Woodland Creature Masks. 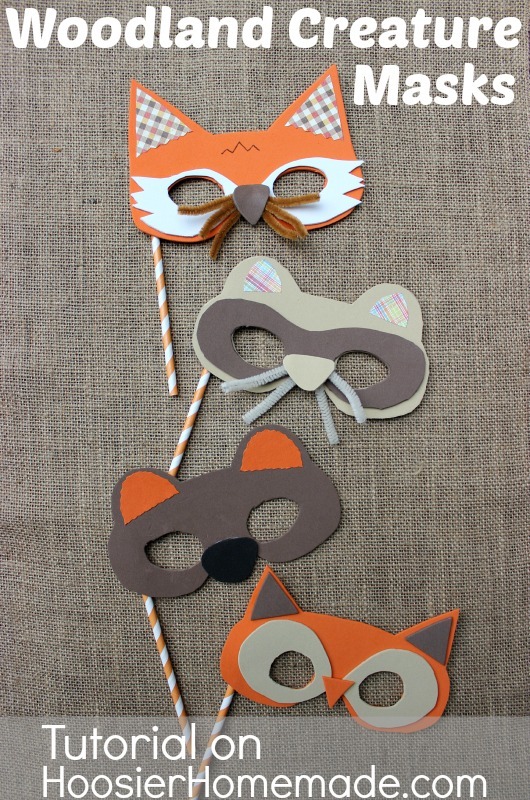 They are not only fun for this Fall Party, but would make cute Halloween Masks for the kids or even adults. After I figured out a basic mask, the addition of each of the faces to make them into the different animals was easy. And even easier for you, although I’m not a great artist, I put together some printable patterns for each of the masks. You can find all the details below. 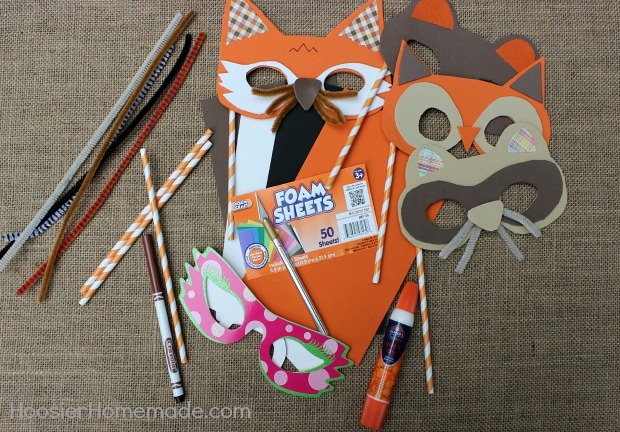 For each of the masks – print out the pattern onto white cardstock or heavy paper. If you don’t have a printer, you can save the pattern to a flashdrive, and take it to an office supply store and they will print them for you, usually around $1 each. Cut out the pieces from the pattern, then tape the ears to the main part of the mask. Then trace the whole piece onto a sheet of foam, then cut out using the X-Acto Knife. 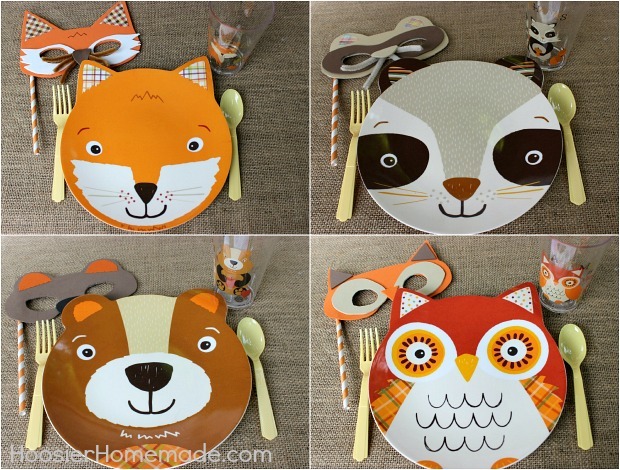 The Squirrel Dish and Owl Plate are also from the collection at Walmart. Watch for the recipe for these delicious Mini Pumpkin Whoopie Pies tomorrow! Additional food options are endless, we love these Buffalo Chicken Salad Sliders, they are perfect for little hands and not too spicy. 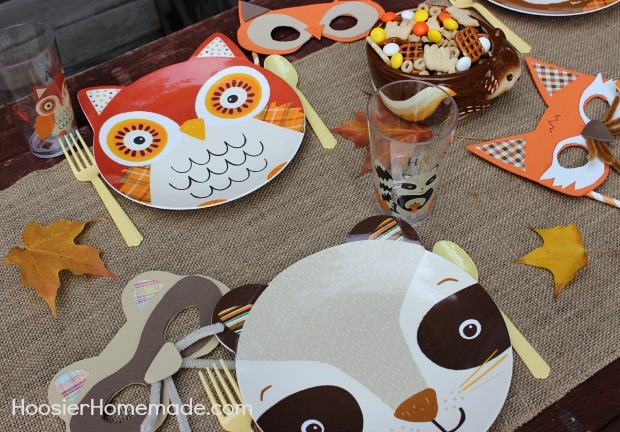 Are you ready to put together this Fall Party? Oh and yes – I will share how to make the Candy Corn Banner soon too! can you buy the plates and cups online at walmart i’m having trouble finding them? if so what is the brand of plate? Hi Amber, the woodland plates were from last year. My Walmart representative told me unfortunately that they are not selling them this year. I bet you could find them other places though, at least something similar. Hi! Does anyone know how I can get the plates? I am searching online at Walmart and can’t find them anywhere! They are adorable! Hi Ember, these plates were from last Fall. Unfortunately, Walmart does not plan on carrying them again, I asked. You may be able to find a similar plate at another store. I absolutely love the animal plates. Its July 2014, just wondering when you found those and if I can still find them? I cant find a date when you posted this. 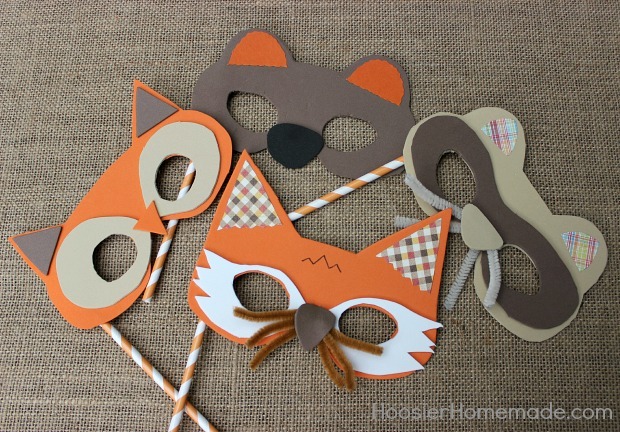 I am having a woodland themed party and HAVE to have these. Just wondering how current this is? Couldn’t find them on Walmart.com. Thanks! Love the post!!!!!! Hi Amanda, so glad you like the party. I shared this last Fall, but unfortunately, after contacting the company after others asked, they won’t be selling them this year. You may be able to find other plates somewhere else that are similar though. 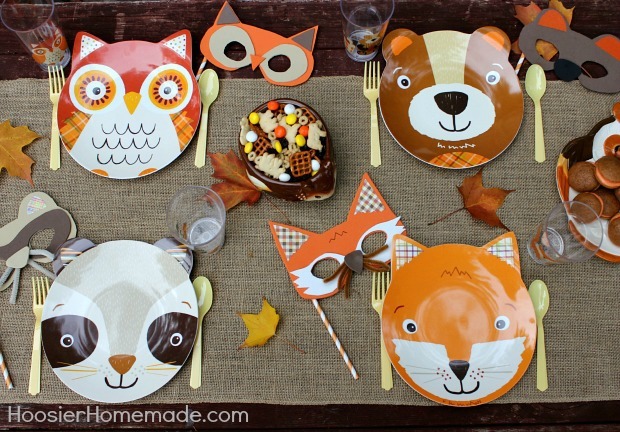 I can’t find those adorable animal plates and can’t seem to locate them at my Walmart. Can you tell me what section you found them? Hi Sherri, they are in the housewares dept. near the plates and silverware. I found them! Yay! They were by the Fall/Thanksgiving stuff at my Walmart! I was so happy! Thanks! I just volunteered for a craft activity for my son’s kindergarten class for their fall festival. I was so excited to come by this craft on pintrest. These are so unbelievably adorable and I think it’ll be easy enough to manage for the classroom. I’m sure it’ll be a huge hit! Thank you for sharing your talent. That’s awesome Kris! I’m so happy you found them, have fun! How cute is this!? Oh my gosh, I love it! I’m trying to locate the adorable plates. Did you buy them recently? Adorable party!!! Hi Kari, yes they are at most Walmart Stores right now. Thanks for stopping by! Yes they are at most Walmart Stores right now. Thanks for stopping by Kari! Hi Lauren, this is from last year. I had another reader ask, so I tracked down the company, but unfortunately I will not be available at Walmart this year. I bet you could use the same concept though and find different plates.